At the invitation of Vice President Li Yuanchao, Vice President Mahamudu Bawumia of the Republic of Ghana will pay an official visit to China from June 20 to 25. Chairman of the CPPCC Yu Zhengsheng and Vice President Li Yuanchao will meet and hold talks with Vice President Mahamudu Bawumia respectively. Vice President Mahamudu Bawumia will also attend China-Africa Industrial Capacity Cooperation-Ghana Promotion Conference. Besides Beijing, he will also visit other places. Ghana is among the first group of Sub-Sahara African countries that established diplomatic relations with China. Vice President Mahamudu Bawumia's visit will be the first official one by the Ghanaian leadership since its new government was formed at the beginning of this year. Both China and Ghana attach high importance to the visit, which we believe will inject new momentum to the comprehensive and in-depth development of bilateral relations, move forward bilateral friendly cooperation, and deliver greater benefits to the two peoples. At the invitation of Foreign Minister Wang Yi, Foreign Minister Aloysio Nunes of the Federative Republic of Brazil will pay an official visit to China and attend the Meeting of BRICS Ministers of Foreign Affairs from June 16 to 20. Foreign Minister Wang Yi and Foreign Minister Aloysio Nunes will also co-host the 2nd Comprehensive Strategic Dialogue between Chinese and Brazilian Foreign Ministers. China is the largest developing country in the eastern hemisphere, and Brazil in the western hemisphere. Bolstered by the comprehensive strategic partnership, China-Brazil relations have seen rapid development in recent years, with exchanges and cooperation in various fields yielding fruitful outcomes. We believe that Foreign Minister Aloysio Nunes's visit will further consolidate political mutual trust, expand consensus on cooperation, and contribute to the sustained and steady development of China-Brazil comprehensive strategic partnership. Q: Yesterday, the so-called "Foreign Ministry of Taiwan" said that due to the pressure from China, the so-called Foreign Representative Offices of Taiwan in five countries that don't have the so-called "diplomatic relations" with Taiwan have been requested to change their names. The five offices are located in Nigeria, the United Arab Emirates, Bahrain, Jordan and Ecuador respectively. Among these countries, Nigeria has asked the Taiwan representatives to leave its country within a limited period of time, otherwise their safety cannot be guaranteed. What are the comments of the Chinese side? A: Our position on this cannot be more clear-cut. 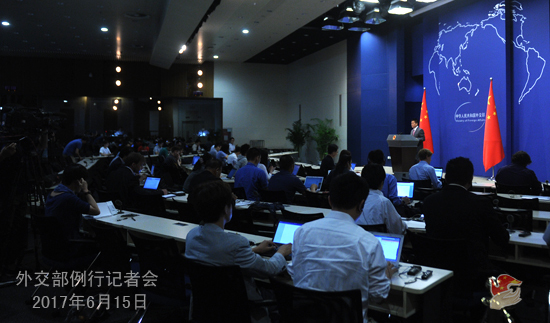 Adhering to the one China principle conforms to the trend of our times and the wishes of the international community. It serves as an important political prerequisite and basis for China to establish diplomatic relations and develop friendly cooperation with other countries around the world. 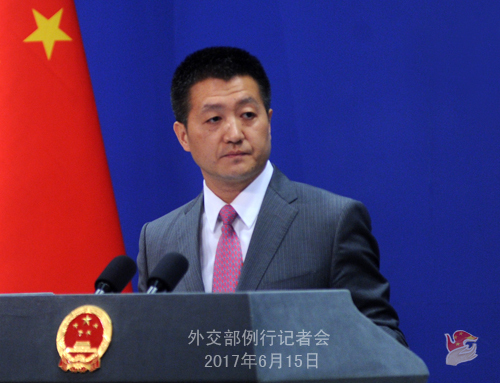 The Chinese government highly commends relevant countries for adhering to the one China principle while handling the Taiwan-related issues. Q: US Secretary of Defense James Mattis said at the US House of Representatives Armed Services Committee that a more aggressive Russia and assertive China are placing the global security consensus under assault. Both Russia and China object to key aspects of the international order built since World War II. The international community faces a risk of returning to Great Power competition. What is your comment? A: I have noted relevant reports. China and Russia, as the main theaters of World War II in Asia and Europe, made enormous sacrifices and significant contributions for the final victory against Fascism and militarism. In 2015, many countries, including China, Russia and the US, held a series of celebration and commemoration activities for the 70th anniversary of victory of World War II so as to remember history, pay tribute to the fallen heroes, cherish peace, and usher in a bright future, which also manifests the firm determination of the majority of the international community in jointly safeguarding the victorious outcomes of World War II. I am not in a position to explain for Defense Secretary Mattis what "the key aspects of the international order" means. China's position is that the international order and system built since World War II, with the UN at the core and the purposes and principles of the UN Charter as the basis, is the most crucial element in maintaining world peace and promoting development. China will resolutely safeguard such an order and system and unswervingly follow the policy of multilateralism. We never believe that the so-called "Great Power competition" which is malignant will serve the interest of China or any other country. What we believe in is a community of shared future where we respect each other and work together for win-win results. Q: Regarding the latest information on the Chinese nationals kidnapped in Pakistan, last evening, the ROK rejected the version that the two Chinese were preaching in that place under the influence of some South Koreans. What is your comment? A: We have noted these reports saying that the two kidnapped Chinese nationals who might have been killed and the other ten-plus Chinese nationals may be used by some ROK religious group to do illegal preaching activities. 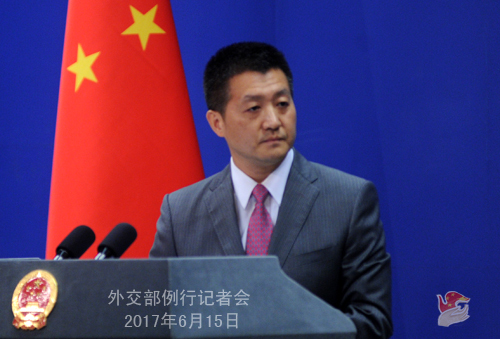 The Chinese government has been highly concerned about the fate of the two kidnapped young people, and is still working with the Pakistani side to verify the relevant situation as soon as possible. Like I said yesterday, the Chinese government always asks its people living and traveling overseas to observe local laws and regulations, respect local customs and practices, and heighten awareness for potential risks. I would like to reiterate that as for reports on Chinese nationals allegedly engaging in illegal preaching activities in Pakistan, I would repeat that we will work with the Pakistani government to carry out investigation in accordance with law. Q: US Secretary of State Tillerson urged China to take concrete measures against those Chinese entities that provide financing for the DPRK's nuclear and missile programs, and said that it would be a core topic for the China-US high-level dialogues to be held in Washington next week. What is your comment? A: Regarding your first question, we have been saying many times that China, as a permanent member of the UN Security Council, has been strictly implementing relevant resolutions adopted by the UN Security Council, including those related to the DPRK's nuclear and missile issues. In practice, we also ask for strict compliance with those resolutions from our nationals and entities by promulgating relevant laws and regulations. If the US discovers any violation on the Chinese side of the obligations undertaken by China according to the Security Council resolutions, it can inform us through the existing cooperation channels of law enforcement. However, I have also said before that we never recognize the so-called unilateral sanctions imposed outside the framework of the Security Council resolutions, since we believe it is not conducive to resolving the relevant issue. As for your second question, China and the US are in close touch with each other on the first round of the China-US Diplomatic and Security Dialogue. We will release relevant information in due course. Q: How does China view its future relations with Panama after establishing diplomatic relations with it? It is reported that following the severing of the so-called "diplomatic ties" between Taiwan and Panama and the establishment of diplomatic ties between China and Panama, the Panamanian students who are studying on scholarships in Taiwan may find it difficult to finish their studies. What are the comments of the Chinese side? A: The establishment of diplomatic relations between China and Panama opens up broad prospects for bilateral cooperation across the board. The Chinese side stands ready to strengthen exchanges with the Panamanian side, including the friendly exchanges in education and people-to-people and cultural exchanges. We have taken note of the fact that the Panamanian students studying in Taiwan on scholarships may encounter some difficulties. We welcome them to study in the mainland and will provide needed and timely assistance to them. As for other Panamanian students in Taiwan, we are also willing to offer assistance to them on the basis of respecting their own will. In the future, we will offer scholarships to Panamanian students in China every year. Q: Yesterday the US Secretary of State Rex Tillerson said at the Congress that the United States adheres to the one China principle while it also will honor all the commitments it has made to Taiwan. He mentioned that whether the one China policy is still sustainable in the next fifty is a complex topic which is under discussion on the part of the US side. What is your comment? A: First of all, I have noted that the US Secretary of State Rex Tillerson stated that the Trump administration will firmly stick to the one China policy. The one China principle is a political basis for the China-US relationship, which is clearly stipulated in the three China-US joint communiques. Since President Donald Trump took office, the top leaders of the United States including President Donald Trump and Secretary of State Rex Tillerson, when meeting with the Chinese side, have all explicitly pointed out that the United States will stick to the one China policy. We urge the US side to stick to its pledges made in the three joint communiques, and properly deal with Taiwan-relation issues with prudence. After all, the one China principle has become a universally acknowledged norms governing international relations and it is also the important prerequisite for any other country to develop friendly relations and conduct win-win cooperation with China. We believe that the US side is quite clear about this. Regarding why Secretary of State Rex Tillerson mentioned the next fifty years, it has to be explained by the US side. I have also noted that some people in Taiwan are getting some illusions because of these words. If these people cannot put into perspective the trend of the development in the next fifty years, I suggest look back at the past fifty years. Recognizing the trend of the international situation, the development trajectory of the China-US relations, and the great rejuvenation process of the Chinese nation, and comparing the past fifty years with the present, they can gain a correct understanding of the future. Q: You said that the two Chinese nationals along with eleven more were found to have been preaching. Has it been established that they are involved in preaching in Pakistan? A: As for reports on these young Chinese people being used by some ROK religious group and engaging in illegal preaching activities in Pakistan, I would repeat that we will work with the Pakistani government to carry out investigation in accordance with law.